Pure authentic backpacking, from the Ecuadorian border of the South, to the Caribbean beaches of the North and back to Quito, Ecuador. Our plans totally changed during the trip, so it is really not recommended to plan that much. After our first Ecuadorian volunteering in Quito and hiking the Quilotoa loop in mid-June 2017, we decided to change countries for a while. The border to Colombia was only a 6-hour bus ride from Quito, so we decided we should try to go there. Our main travel priority was going south,-to Peru and Bolivia, but when we were in Quito (so close to the border) and all the backpackers who stayed in the hostel coming from Colombia were going south, it was not that hard to make a small detour in our itinerary. We were so fascinated by that country and the great stories other travelers told us about that once-very dangerous state. Back in Quito, during the hostel volunteering in May, I tried to contact several Colombian hostels in the Caribbean asking for volunteering vacancies. We got a few contacts from our Colombian friend Ivan, who worked with us in Quito. There were almost no answers so we decided not to go that far. 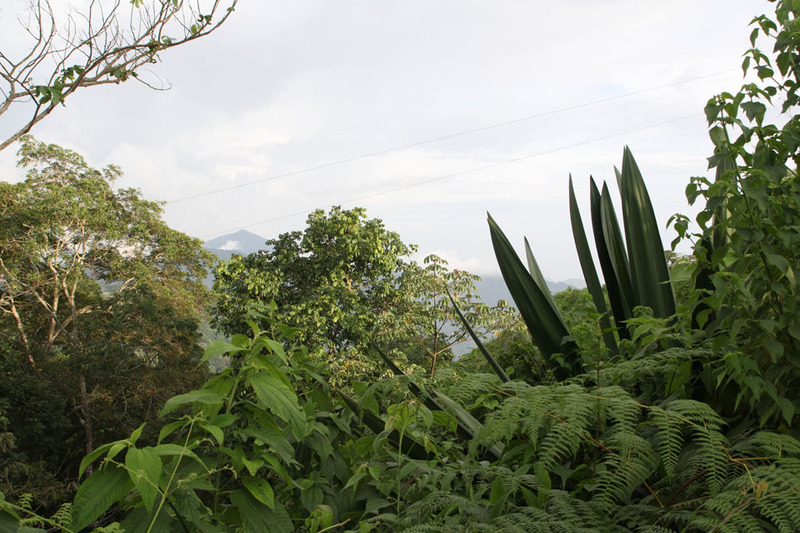 The initial plan was to see the closer regions of Colombia and store our big backpacks while we visited nearby areas. Colombia is a huge country, it is 4th largest state in South America. In the end, we stayed for six weeks and mainly in the far Caribbean area. 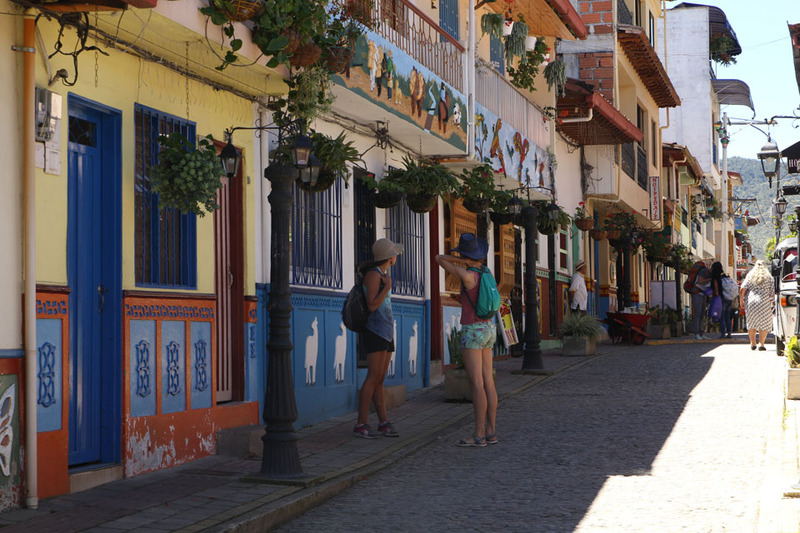 The journey from the Ecuadorian border (Ipiales) to the Atlantic coast (Cartagena) was made slowly during several days and took three night buses (Ipiales-Cali, Cali-Medellin, Medellin-Cartagena). For the return, we chose cheap flight from Cartagena to Cali, which actually cost less than those two bus rides on the same route. 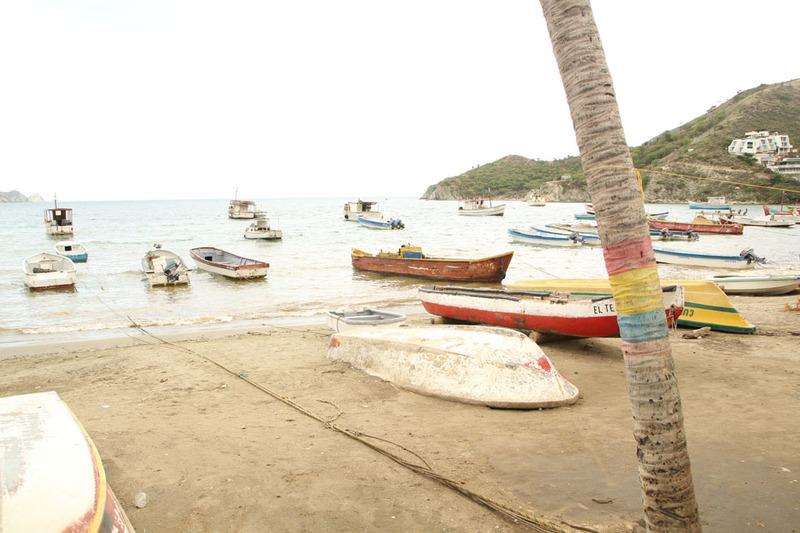 From Cali, we had to survive a not-so-easy 12-hour bus ride up to the border, to Ipiales. It was really a good idea to pay more for more luxurious bus companies when we headed to the coast. Reclining seats, enough space for our long legs, toilet on board and almost no stops during the ride. Once, we even got drinks, snacks and every seat had a screen with many movies to watch. Colombia really amazed us from the very first day, in the same way it happened with many other travelers. The nature is great, there are the Andes, the mountain range of Sierra Nevada de Santa Marta is supposedly the highest coastal mountain in the world. Caribbean beaches were stunning, wild jungle coast of Tayrona park was Peter´s highlight, and the big cities we visited as Cali, Medellin and Cartagena had all their own unique atmospheres. Other attractions included, the people and their stories, the food and he lovely weather. Most probably all of us heard about infamous Pablo Escóbar, FARC and Colombian drug cartel wars from the 90-ties. But you might have also heard about the latest Nobel peace prize laureate, current Colombian president, Juan Manuel Santos. He was awarded this prestigious prize for his successful negotiations with the guerrillas and the overall improvements of the country. 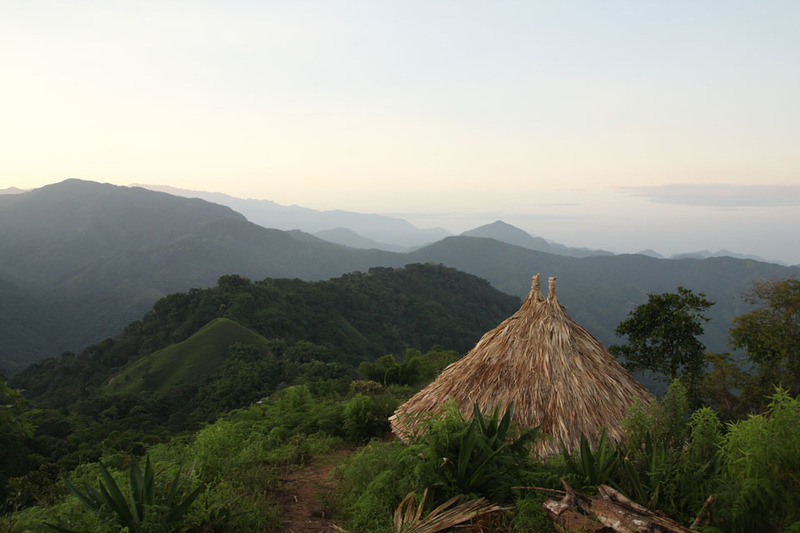 There are still many areas in Colombia which are not recommended for visiting, located mostly in remote jungle regions and bordering areas with Venezuela. The important thing is that Colombia is becoming a real paradise for backpackers, the tourism is booming and cities are receiving prizes for innovation. 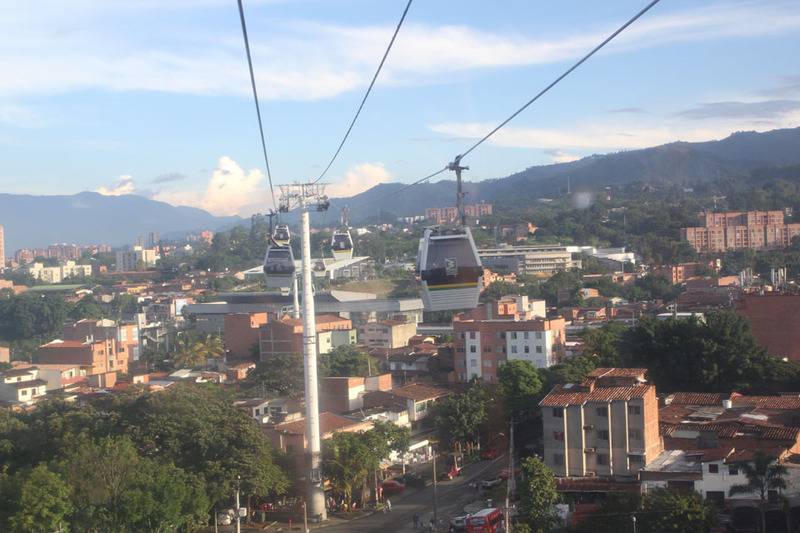 For instance, Medellin got many significant prizes as the most innovative city in the world. It all began in Cali. The city lies in the nice altitude (1000 m) so after spending almost two months in a cold and rainy Quito (during the majority of May 2017, there was still persistent rainy season), we were finally able to wear summer clothes and enjoyed the subtropical weather. 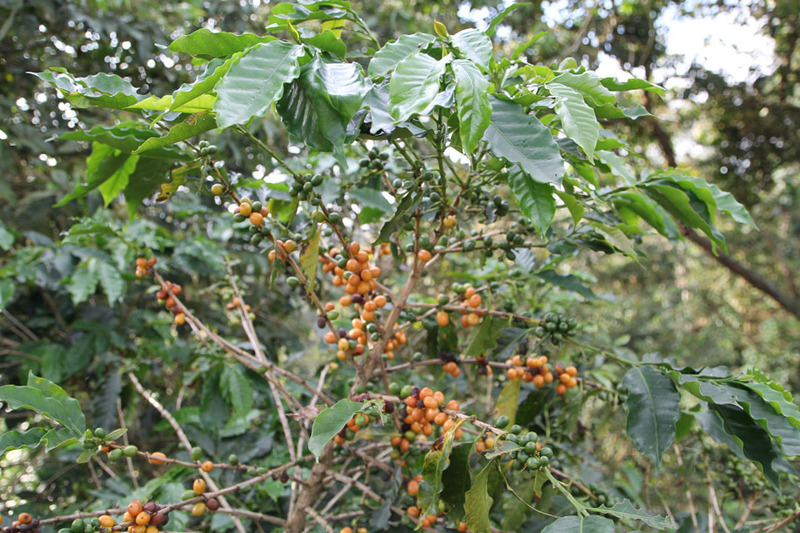 Our first impressions from Cali, thereof from Colombia were: it is so hot here! And the Caribbean spirit is all around even though the Atlantic is so far! 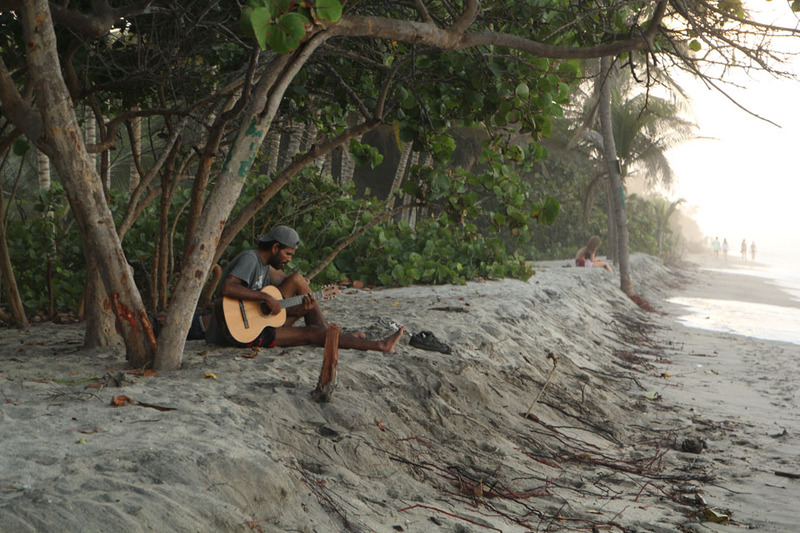 Music is played everywhere and the people are all super smiley, friendly and happy! And so this we experienced through the whole country. Medellin: second largest city, former residency of infamous Pablo Escóbar, nowadays probably second most visited destination in Colombia. 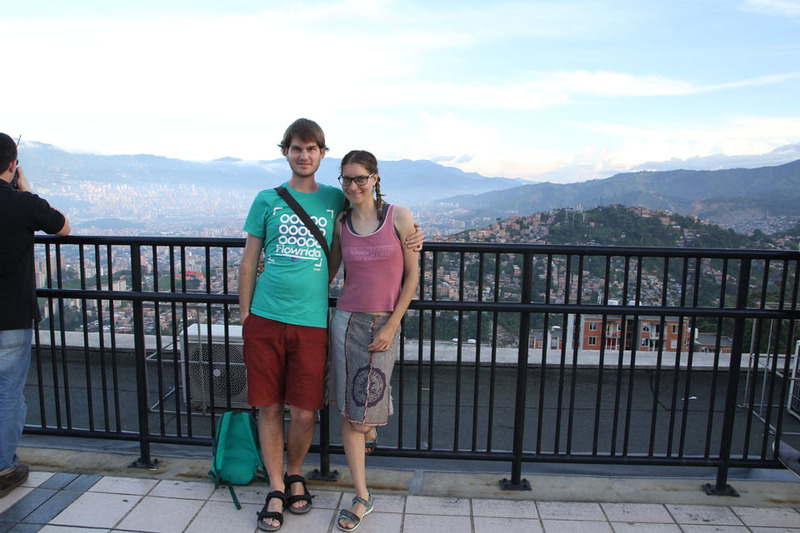 We stayed in Medellin for a week and had a really good time. It lies in the 1500 m. altitude which guarantees spring weather all year round. Taking local public transport is an authentic experience. The elevated metro train is fast, clean, safe and provides nice city views. The elevated trains were not nearly as rare as cable cars while using public transportation. Medellin is surrounded by the Andes and several higher elevated and remote neighborhoods were not very accessible from the center. That is why organized crime easily penetrated there. The cable cars really improved the situation. Another interesting transport element are Electrical stairs which have the same goal. 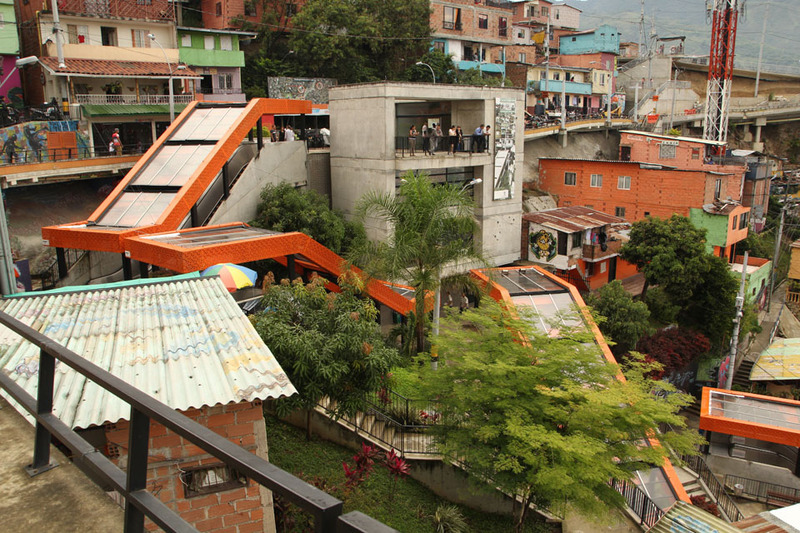 Once very problematic ghetto Comuna 13 is nowadays experiencing big transformation partially thanks to the Electrical stairs. Graffiti walking tours are booming over there and the positive street art has an influence. The public library on the Cisneros plaza is huge and free and we managed to work from there twice. 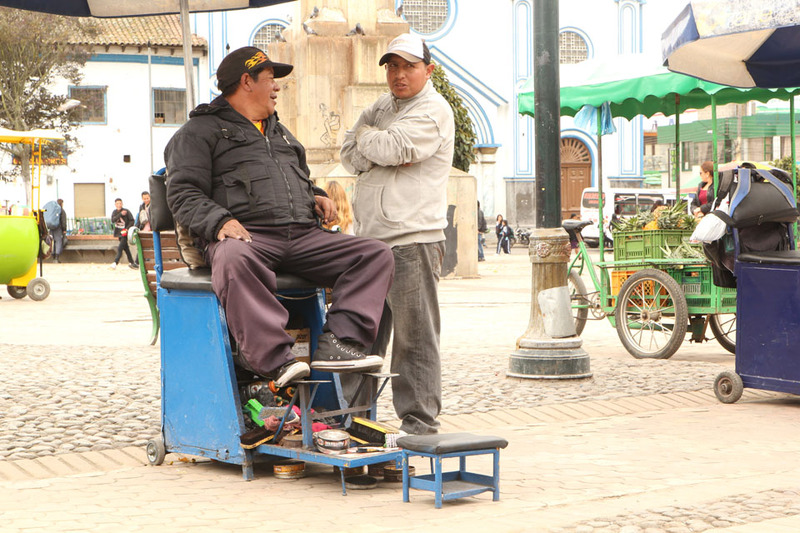 Peter worked on finishing a web project and I was writing an English article about Quito. Medellin is a capital of tango dancing and we went to the International Tango Festival there. The entrance was free and it was open-air. Carlos, our CouchSurfing local friend took us there. We posted an open meet-up request on the CS Medellin site and he was the one who replied. Carlos is a university student and with him, we experienced regular student drinking Friday on the campus. The place really reminded us of the campus at Mlynská dolina in Bratislava. Cheap alcohol, cheap street food, various levels of drunk students, police passing by, it is a regular thing, these patrolling policemen :-). But besides that, it really reminded us of campus in Slovakia! Even the high dormitory block buildings were there! 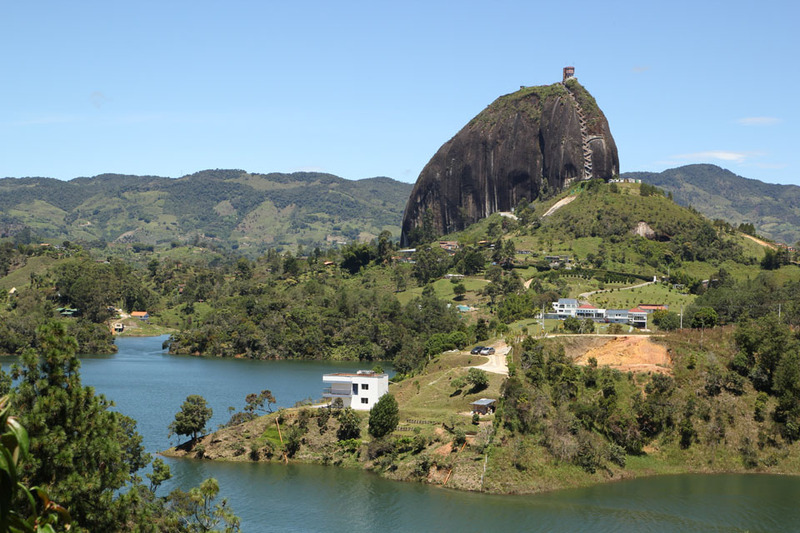 At two-hour bus ride from Medellin, at the elevation of about 2000 meters is situated remarkable monolith La Piedra. 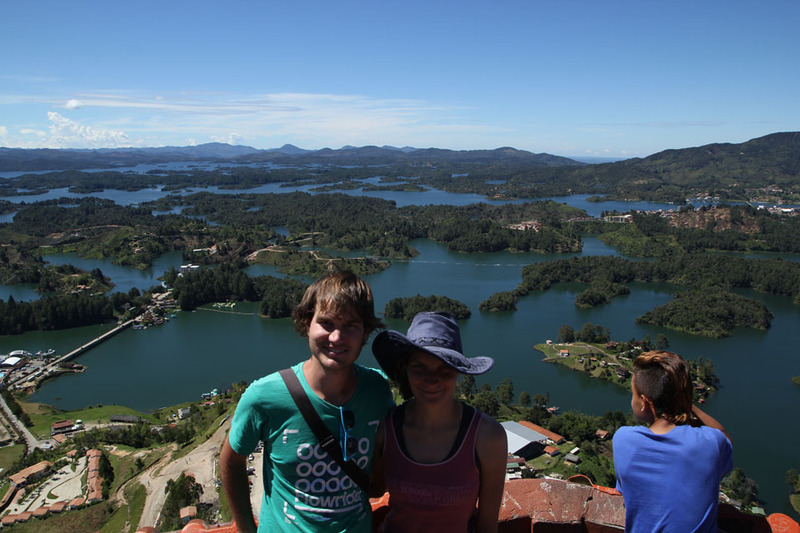 It is possible to climb up the rock by the stairs and admire the largest artificial lake in Colombia from the top. The dam was built in the 1970-ties and at that time, it was the most sophisticated construction of that kind in the country. It was necessary to get flooded several small villages and that is why the village of Guatapé looks so interesting today. The settlement was newly build on the lake´s shores. The biggest attractions are painted tiles on the facades. Unique zokalos. The climb up the rock was worth those views! We might never have heard about that place. A few weeks before our planned trip, my brother´s best friend posted pictures from there on the blue social network and since then I was in awe. Thanks Robert, for the great tip! Exactly one week before our arrival, tragedy happened there. A tourist boat sunk in the lake and nine Colombians drowned. There were candles lit every night for remembering the victims and since then, every passenger on the vessel was obliged to wear life vest during the whole trip. After spending almost three months in the Ecuadorian and the Colombian Andes, we spent one whole month in sunny and hot Caribbean. While sunbathing on the Atlantic coast, we visited many towns and villages. 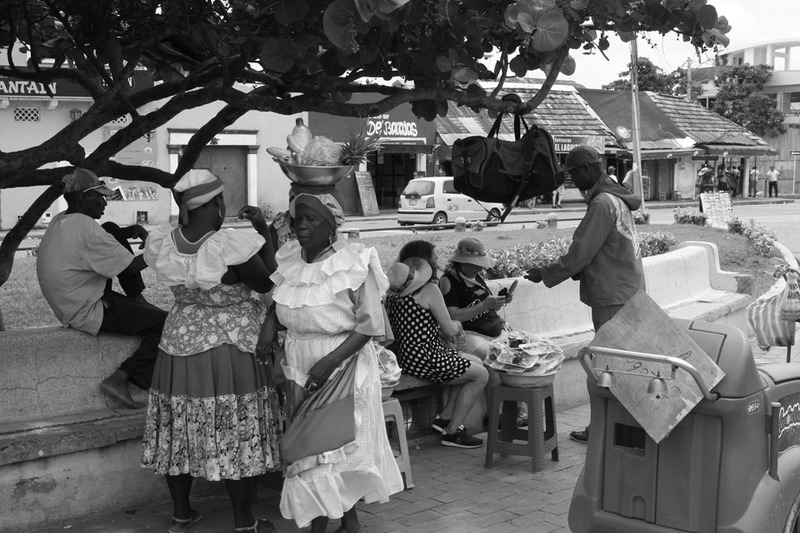 It didn´t really look like those famous photos from the Caribbean islands, but we fully and truly enjoyed the area. Swimming on a daily basis, sun-tanning and fighting with disturbing mosquitoes were our daily duties. 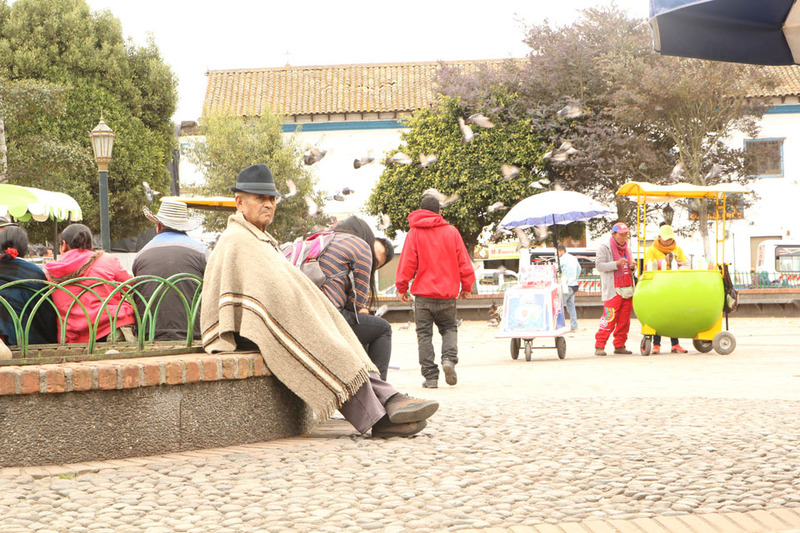 At the end of that time, we looked forward to the Andean coldness. This was our first Caribbean destination. Santa Marta is nice, middle-sized city with touristy historical center and terrible public transport. Swimming in the sea and city walks were interesting but taking super slow city buses was very annoying. They stopped every ten meters and it always took ages to get anywhere. We tried accommodation through Air-BnB and we stayed for four nights with Rosalda, a nice old lady. The change of air was needed after bad experience from hostel volunteering. It was actually too hot, sweaty, humid and too many mosquitoes at the beach, so we moved to the mountains for three nights. 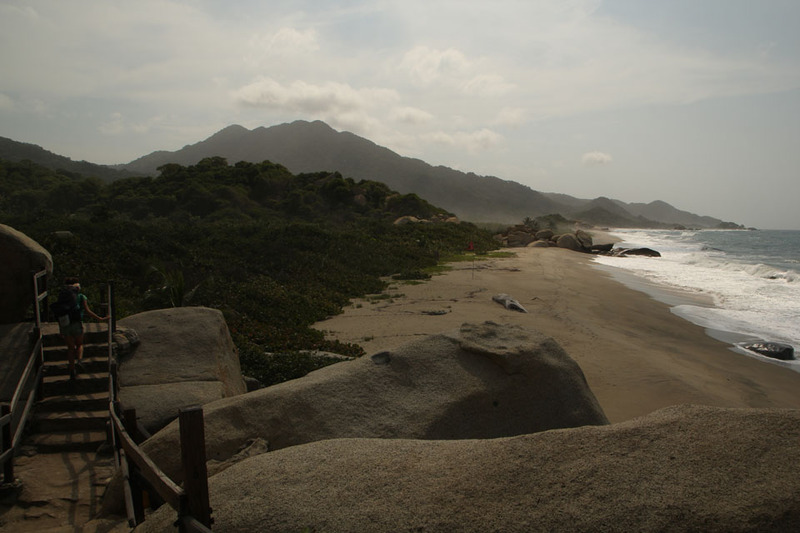 Sierra Nevada de Santa Marta is the highest coastal mountain range in the world. 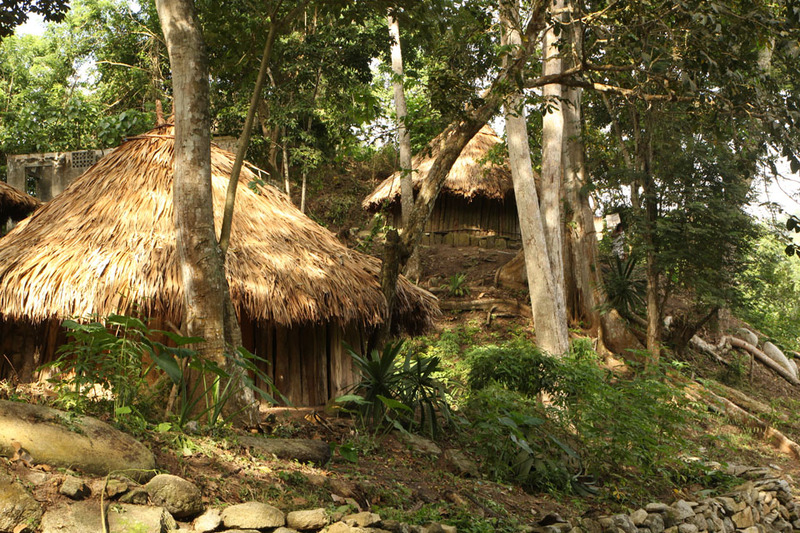 Deep in the hilly jungle live the indigenous population of the Kogis Indians. It is prohibited to take pictures of them so we only observed them silently. They wear traditional white dresses and both men and women have long hair. Two highest Colombian peaks are located in this mountains: the snowcapped Pico Colón and Pico Bolívar (both over 5700 meters). We had the chance to see them once from far at sunrise when the sky was really clear. There were unfortunately not less mosquitoes than in the coast, an additionally, sand flies and other molesting insects were biting us constantly. The humidity was very high too and we got wet a few times because of the strong showers. However the overall experience was very positive: we cleaned our minds and did nice hikes in an amazing environment. Nowadays, we put this place in our Colombian top sites. We stayed together five days in this quiet fishing village. At first, it was three nights and then, we returned again for another nights. 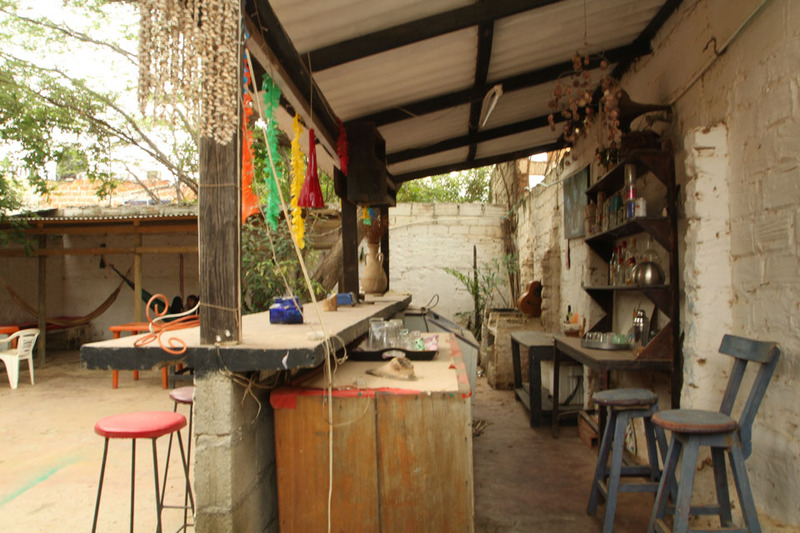 We stayed in Garaje hostel whose owner is Angela, very nice lady. After running a famous bar for many years, she changed the business. The bar had closed because all night life moved to the beach and she started renting out her kid´s rooms. We fully enjoyed the place, the beach was shallow without big waves. Palomino is divided in two parts. The first zone is situated along the main road heading to Venezuela. There are many local shops, restaurants and the center of the town. Second zone represents long unpaved street leading towards the beach. This road is full of fancy backpacker hostels, campings, gringo restaurants and bars where you can pay in dollars and euros. It is not really possible to swim in the sea there as the waves are super big and warnings about strong currents are omnipresent. But for playing wildly in the waves, the place is perfect. There is a delta of several hilly rivers in Palomino so the popular attraction to do is tubing. We didn´t try, but we saw it 🙂 And swimming in delta is amazing too! We hitchhiked from Palomino to Riohacha. It was quite fast and we were picked up by a young truck driver from South Colombia. There was only one passenger seat, so we had to squeeze we somehow survived those two hours. Our conversation with the driver was not that fruitful, maybe his slang was too confusing to us or it was super noisy in the truck cabin. In Riohacha, CouchSurfer Carlos hosted us for two nights. He is an university English teacher and very educated and informed guy. And also he was an oldies music and art movies lover. The debate about the dissolution of Czechoslovakia had never been that profound with anyone else during all my travels. He knew key figures and many background connections. We were seriously surprised. And then, after few hours of heavy Friday drinking of Venezuelan Caribbean rum, this person changed into someone barely under control. He started insulting us and our country´s history and the situation went really bad. We ended that strange moment simply by going to bed. Our sleeping place was his terrace or rather his open-air living room and two hammock used as beds. He almost didn´t speak with us the following day and the other morning, we left the place. Really bitter taste of CouchSurfing. On the other side, the town really surprised us. There were almost no tourists, the sea was not that wild than the previous place, so we could swim. The air changed from the humid one into the dry desert one. Those mosquitoes didn´t really bite us. The food was super cheap in comparison with other visited places so we fully enjoyed famous arepas de queso, local specialty, very tasty corn pancakes for only 1000 COP (0.25 EUR). Our first intention to come to Riohacha was to cross the borders to Venezuela and travel that country. 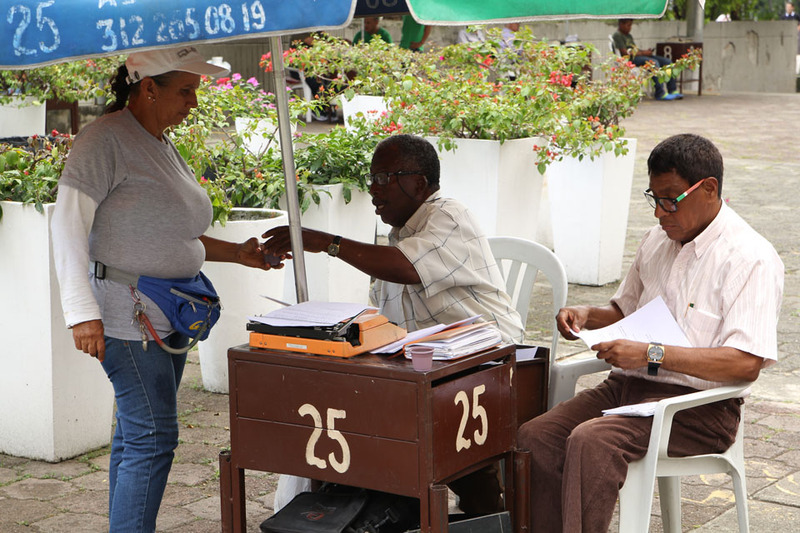 However the current situation in Venezuela is really severe, so we were intensively communicating with locals from Maracaibo, which was the city we planned to visit first. 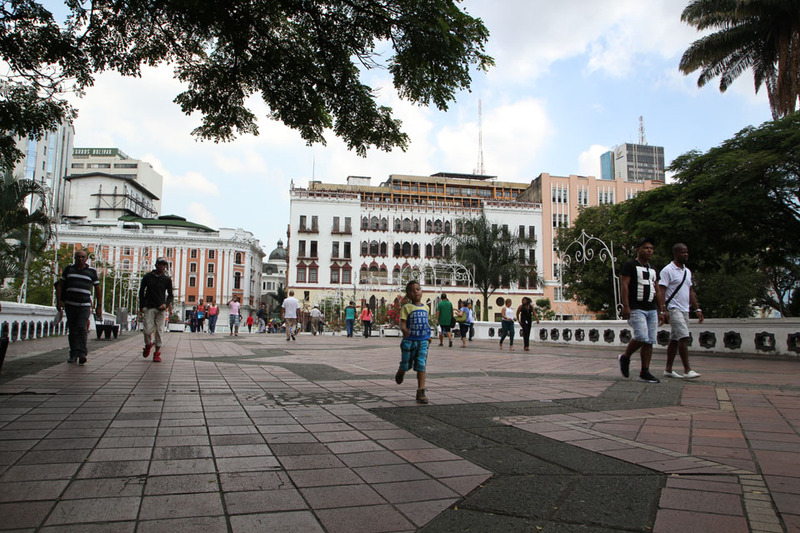 We also kept in touch with other travelers who traveled Venezuela recently and asked for tips. We were ready to hide our US dollars in socks and underwear as it was recommended and exchanged money in a black market. On the day of actual border crossing, our Venezuelan CouchSurfer from Maracaibo wrote us that we should reconsider our arrival and wait for another weeks until the election takes place. Planned strikes and street closings were announced. We didn´t want to wait that long so we changed our plans. Venezuela was no longer on our list and we bought a flight from Cartagena to Cali for the following week. Visiting this park was not planned at all. The entrance to the reservation cost 50 000 COP (13 EUR) and everything seemed that the place was over our budget. 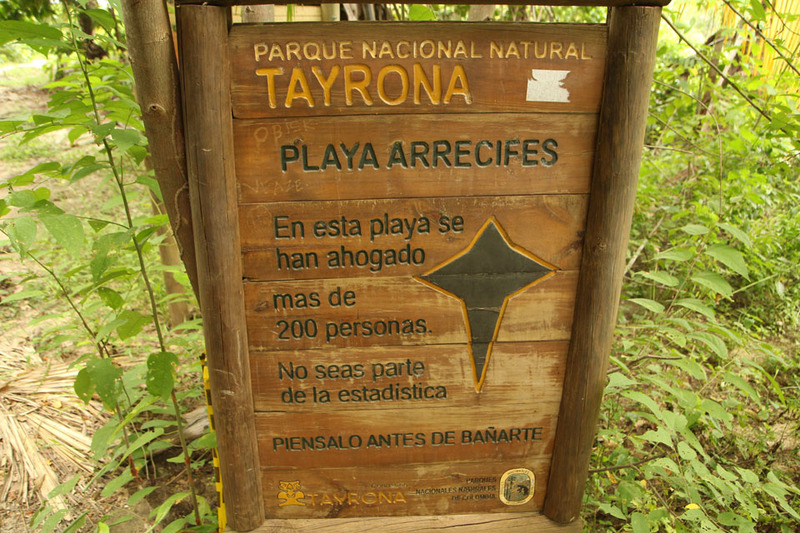 After modifying our plans, when we decided not to go to Venezuela, Peter said that we should try Tayrona park. All the backpackers who came from the reserve were fascinated but also hardly biten by insects. The problem appeared with planning that trip on a budget. Knowing that food and drinks would be super expensive there, we simply bought supplies in Riohacha, canned tuna, nutella, bread, candies and avocado. 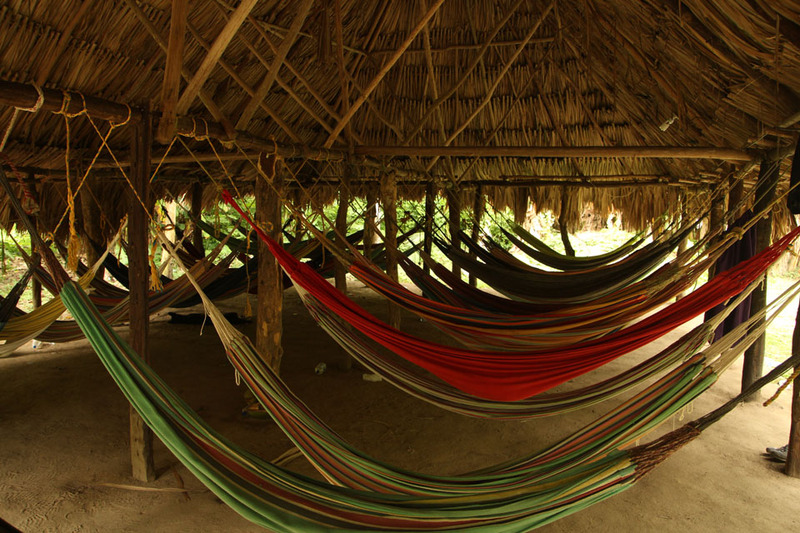 When paying the entrance fee, we bought the cheapest accommodation possible in the hammocks for 15 000 COP per person (4,5 EUR). We carried about three liters of water. The whole park is quite huge without regular transport. There is the possibility to take a shuttle from the eastern entrance closer to the sea, what we did. There was still almost two-hour jungle walk ahead of us. It was super humid but we somehow managed to arrive safely to our camping though our bags were not light at all! It was definitely worth it! 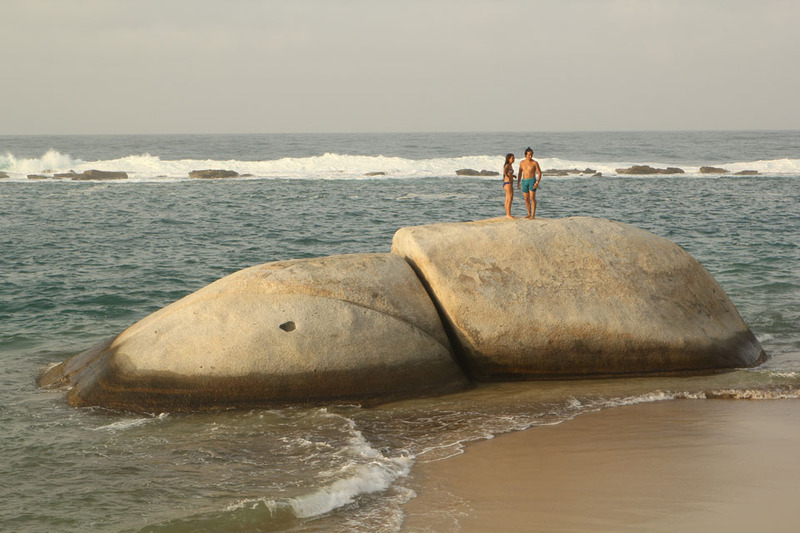 Two days in Tayrona park are now among our top Colombian experiences. Beautiful savage beaches, thick jungle and super darkness after the sunset. There was no electricity in the camping during our first night so we had a nice dinner by the candles 🙂 It was not possible to swim in most beaches due to the strong underwater currents so those two secluded beaches where it was possible to swim were overcrowded. We enjoyed it anyway. Our citronella oil against mosquitoes was almost gone when we left the park and we luckily didn´t have any strange insect bites. It was apparently not a season of bad bugs. 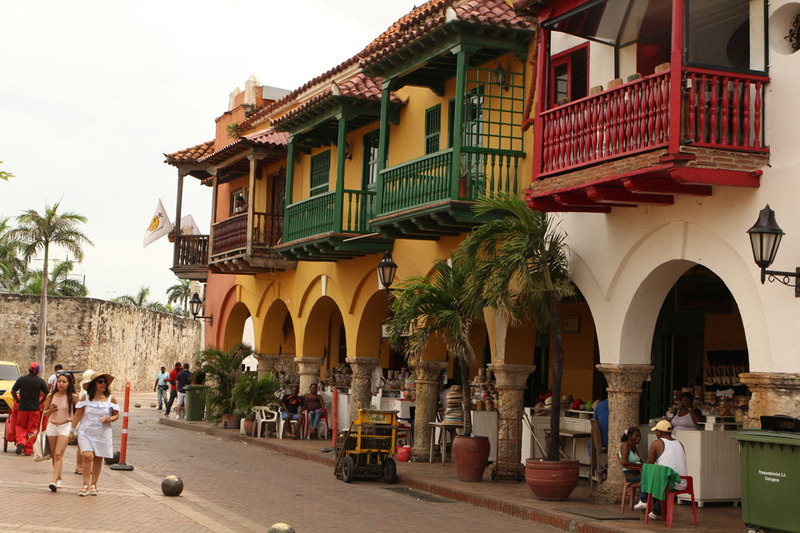 Cartagena, the jewel of Colombian Caribbean was our last destination in the North. This developed city is full of tourists and the prices are quite high. All the locals approached us in English which was a big change after the whole month in pure Spanish. The historical city center, listed in Unesco is very well-preserved. 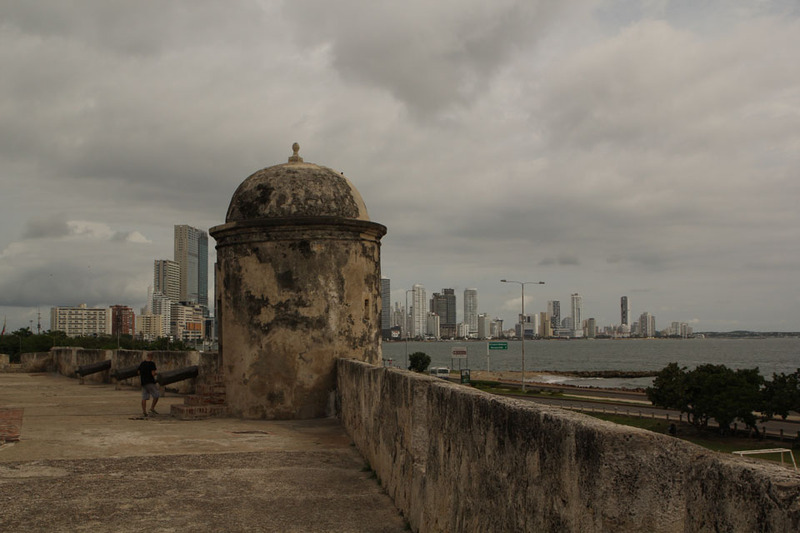 We walked along the fortification walls daily, admired this open-air museum and enjoyed the skyline from the distance with a local beer at night. There are several small good city beaches located just in front of big high rises. We managed to have a nice swim twice. Our Dutch friend Bart, with whom we volunteered earlier in Quito, was in Cartagena at the same time so we hung out together and talking about travels and life. There is one low-budget airline operating in Colombia with very affordable domestic flights. Buses to/from Cartagena were two-times more expensive than the flights on the same routes, so we bought fly tickets from Cartagena to Cali and then we took painful 12-hour day bus to Ipiales. Our very last Colombian stop was Ipiales, a town located high in the Andes (in almost 3000 net res). It was a big change to be at altitude again after one month stay on the coast. We had to put on every piece of warm clothes we found in our backpacks and were ready to explore this non-touristy part of Colombia. The prices were very low and the air temperature even lower. 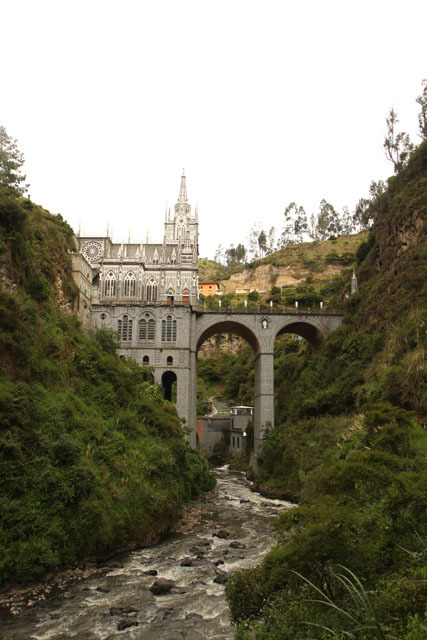 Visiting nearby church in Las Lajas that was built inside the deep canyon was a breathtaking experience. 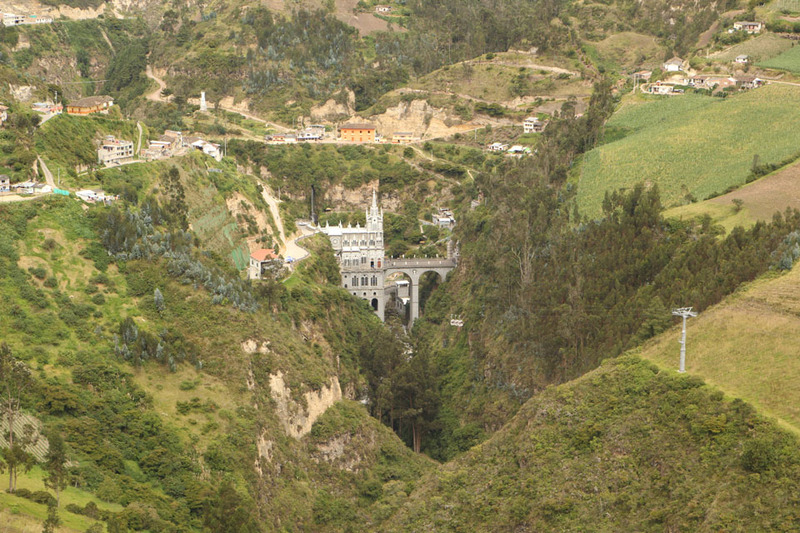 Ipiales: the church was built inside the 100-meters canyon. We are very glad we had the chance to visit Colombia. It was so interesting observing how this once a very dangerous country is transforming into a tourist-friendly and safe place and becoming (or rather already is) a backpacker´s paradise. We highly recommend to visit!